Stephen and Anne try to raise their two daughters in Cambridge (UK). 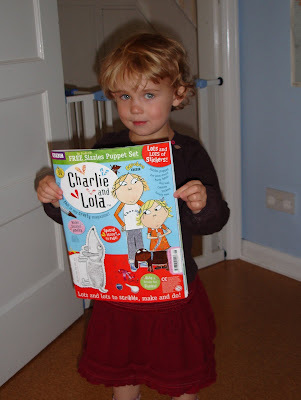 ThingOne got a bit of a surprise in a newsagent today as she sat on the floor leafing through a new Charlie and Lola magazine. I think I've mentioned before that ThingOne is a big C&L fan, and we think she's not entirely convinced she isn't actually Lola. Anne found her looking quizically at the photos on the readers' pictures page. "Is that a boy or a girl?" ThingOne asked. "Do you know who that is ThingOne?" Anne asked. "Yes, it's me", said ThingOne, shutting the magazine. Strange little child. She's so used to seeing photos of herself (and frequently asks for a Picasa slideshow - eg "Please I watch photos from the holiday in France when I was one and a half") that this didn't surprise her much. 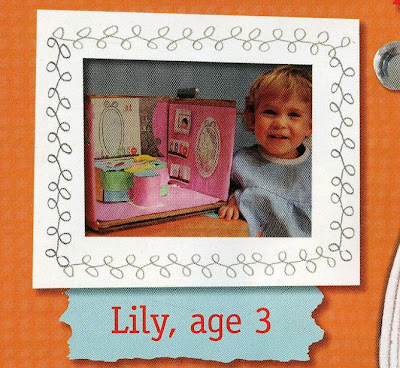 Mind you, it says something that even ThingOne couldn't initially work out if the photo was of a girl or a boy. Even now she gets mistaken for a boy by strangers. ThingTwo does too - it's the lack of hair - but that's more understandable at 16 months. Recently ThingOne's refused to wear trousers and insists on wearing dresses or skirts every day, so that's helped. Now people know she's a girl and Anne and I lament all the nice trousers and tops she has that she won't wear. Anne bought the magazine once she saw ThingOne was in it. Anne's away this weekend. What craft project will I end up creating then? This is a Flickr badge showing public photos from skenttaylor. Make your own badge here.